An intimate examination of the human ego, this movement piece employs a clever plot device to make a bold statement. The thing that makes live theater so great is that “theater” doesn’t necessarily refer to any specific style or art form. In a way, the idea of theater is the manifestation of expression. Theater exists for those out there with an idea. These ideas are then expressed—born—in the performing arts. 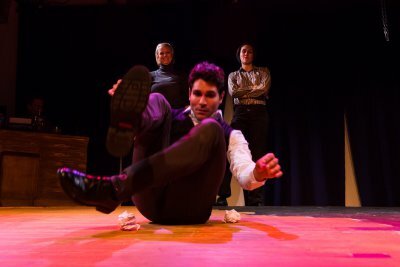 In a piece which combines the many different forms of fine arts, Rough Draft is an unconventional and challenging expression of theater from the collaborative minds of the ensemble based Improbable Stage. In premise, the play is a glimpse into the life of a mystery/thriller writer named A.J. (Bill Chameides), but a bigger idea exists in Rough Draft thanks to a unique plot device: A.J. is deconstructed on stage as a group of seven actors physically embody the different aspects of his personality. While Chameides is tucked behind his desk and writing on his typewriter for much of the show, his manifested personality traits use movement and vocals to convey his wide ranging actions and emotions. Directed by Stacy A. Donovan, Rough Draft is a true ensemble piece. With acrobatics and dance seamlessly intertwined with small spurts of dialogue, this is a physically demanding show and nary is there a break in pace. Though the roles are divided equally, some characteristics such as the Skeptic (Danielle Mumpower) and Integrity (Victor Cervantes Jr.) stand out individually, while other moments unite the varying traits to convey a powerful statement. As an example, a duet between the Inner Child (Tali Custer) and Idealism (Dylan Wittrock) is a movement piece where the Inner Child attempts to help the writer reawaken his idealism in what amounts to a playful and hopeful dance. Performed at The Wild Project, a stylish downtown venue with a raked stage, the set (John Lavigne), lighting (Robert M. Stevenson) and sound design (Jorge I. Sanchez) all compliment the production and enhance the overall experience. 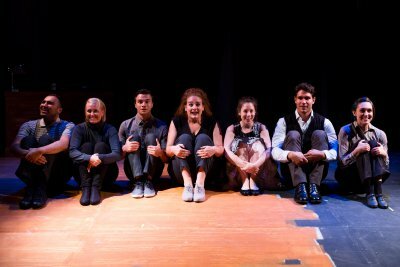 Co-written by Wittrock, Donovan and Custer, and conceived and developed by the members of Improbable Stage, Rough Draft is a piece of theater which remains in its own category; a challenging, creative, and unique work presented by a group of talented artists with a message. An old radio show-style adaptation of Brecht’s cheeky 1930’s, Chicago mobster parable about the rise of Hitler. Poet Glyn Maxwell’s radio play of the Dostoyevsky novella has become a stage play courtesy of Phoenix Theatre Ensemble. Jesus Christ and Pontius Pilate appear in this dynamic revival of playwright’s Robert Patrick’s 1973 wickedly counterculture exploration of religiosity.